Hi guys! Another Christmas manicure from me this Monday, but as it is still a bit early I am keeping up with the 'alternative' or more abstract Christmas designs. As last week I did the red and green side of Christmas, this week I am doing the bling! Now most of the time when you think of Christmas, red green and gold are the first things that come to mind. But as you guys may know, I prefer silver over gold. So that's what I am using, and I have the perfect polish! The polish I am using is actually part of an old China Glaze Christmas collection! It's China glaze Tinsel town, a gorgeous glitter polish made up of different sizes of silver glitter in a clear base. You actually can get this polish to be opaque on it's own, but I wanted to do a little bit of nail art, so I made a gradient with it over Essence Rock my world. 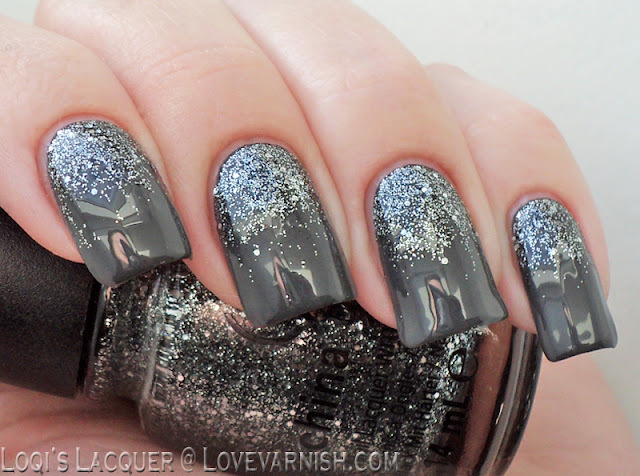 Rock my world is a lovely and shiny medium grey that covers in 2 coats, a perfect base for the glitter!